Secretary of State Hillary Rodham Clinton will travel to Liberia, Cote d’Ivoire, Togo, and Cape Verde on January 16-17, 2012, to demonstrate U.S. commitment to post-conflict return to peace, good governance, and economic development as well as to emphasize U.S. focus on democratization. While in Liberia, Secretary Clinton will attend President Sirleaf’s inauguration and preside over the ribbon-cutting of the New U.S. Embassy Compound in Monrovia. In Cote d’Ivoire, she will meet with President Ouattara to showcase our support for national reconciliation and strengthening democratic institutions following successful legislative elections in December 2011. In the first visit of a Secretary of State to Togo, Secretary Clinton will meet President Faure to demonstrate U.S. support for Togo’s democratic progress and economic reforms and to congratulate Togo on its recent election to the United Nations Security Council, where it holds a non-permanent seat for 2012 and 2013. 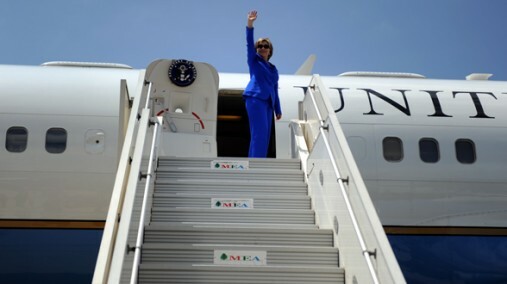 In Cape Verde, Secretary Clinton will meet Prime Minister Neves to discuss cooperation on regional issues like counternarcotics, good governance, sound economic policies, and Cape Verde’s second Millennium Challenge Corporation (MCC) Compact. Elisabeth Kvitashvili serves as U.S. Alternate Permanent Representative to the United Nations Agencies in Rome, Italy and Humanitarian Affairs Counselor, U.S. Agency for International Development. I have spent a lot of time in many countries in Africa, usually countries suffering from some type of man-made or natural disaster. While no agriculture expert, my eyes are trained enough to seek out and identify problems and solutions that touch on food insecurity. I usually find a somewhat despairing situation. Recently, after travelling on the bumpy to non-existent “roads” of South Sudan, I came away impressed — impressed with the hopeful vision of a country that has enormous potential to move quickly into a state of relative food self sufficiency, perhaps within less than a generation. And the women of South Sudan are playing a big part in the country’s drive towards recovery. According to Ofeni Ngota Amitai, the minister of agriculture for Morobo county, women are critical to helping the country move away from humanitarian interventions towards a more balanced foundation of recovery. While on my field visit to the Eastern and Central Equatoria states, I witnessed the collective efforts of the United Nations Food and Agriculture Organization (FAO) and World Food Programme (WFP), both of whom receive valuable financial support from USAID, to support the Republic of South Sudan’s endeavors to tackle food insecurity through a wide range of recovery activities. South Sudan remains a major recipient of food aid, much of it supplied by the U.S. government through the World Food Programme. The food security outlook for 2012 is worrisome for the 1.2 million people of South Sudan, a new country comprised of 10 states, with a wide range of agro-climatic conditions and a population that includes traditional farmers and agro-pastoralists (farmers who also raise livestock). Livestock is key to the livelihoods of millions of South Sudanese, so keeping animals healthy to ensure availability of meat and milk products but also cash from the sale of cattle is a major concern of local officials with whom I spoke. Unfortunately, disease outbreaks are common and with very limited government capacity to handle such cases, treatment has been hard to come by. 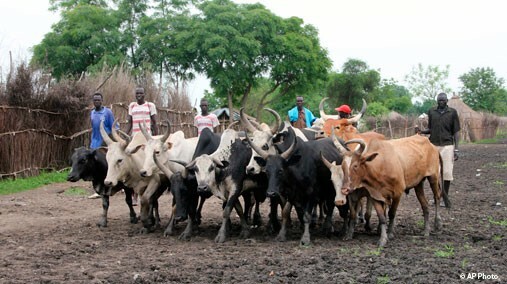 With support from FAO, however, South Sudanese agro-pastoralists are being given initial supplies of vaccines and are being trained to vaccinate livestock. People will pay to have their animals vaccinated, so cost recovery is introduced to ensure vaccinators can replenish their supplies. I watched a group of semi-nomadic agro-pastoralists, including women herders in one cattle camp I visited in Torit, successfully vaccinate over 100 long-horn cattle in just one hour. And as one woman vaccinator walked me through her village, she explained how she was putting her three children through the local school “in town” with the increased income she had from selling healthy cattle. Elsewhere, in Yei and Morobo in Central Equatoria, women were hand threshing just-harvested sorghum and pearl millet grown from seeds they had received as participants in an FAO-sponsored community-based Seed Production and Supply activity. This activity is implemented by the Kogbo Multipurpose Farmer Group and Equatoria Farmer Extension Advisory Association in collaboration with the Morobo Agriculture Department. Since Yei and Morobo are part of South Sudan’s “green belt,” improved availability and access to quality seeds is key to helping increase local production, thereby reducing dependence on imports from northern Uganda. Everywhere I went I heard the same refrain from South Sudanese…we want to reduce our reliance on humanitarian assistance as we have the land and ability to produce enough ourselves. Farmers want to move away from subsistence to commercial farming and need assistance in getting increased production to the markets of South Sudan. With support from their partners at FAO and WFP and commitment from their government, the South Sudanese are on a good path, despite the many obstacles, towards their goal of becoming food self-sufficient. Greg Shaw serves as Regional Refugee Coordinator for the Great Lakes in the Bureau of Population, Refugees and Migration. 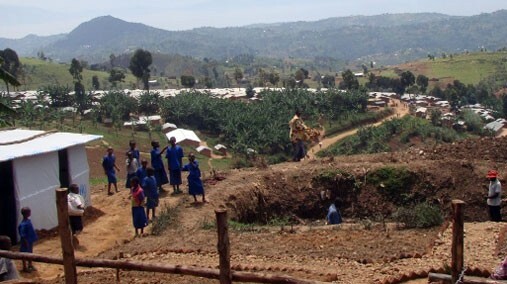 As one makes the final approach into Kiziba Refugee Camp, located at more than 2,000 meters above sea level in the verdant hills above Kibuye town in western Rwanda, you are treated to spectacular views of the shimmering waters of Lake Kivu several hundred meters below. The camp, home to 18,950 registered refugees who fled fighting in the eastern portion of the Democratic Republic of Congo, is divided into 10 neighborhoods, each divided into five villages which include approximately 70 houses. Refugees live in detached family houses of 4.5 x 3.5m built with wooden poles with the sides covered with mud and the roofs made from plastic sheeting. Kiziba is well managed by the Government of Rwanda (GoR) with technical and financial assistance from the UN Refugee Agency (UNHCR) and several non-governmental organizations (NGOs), including the American Refugee Committee (ARC). ARC has embarked on a “Humanizing the Camp” initiative which involves refugees making no cost/low cost improvements to the camp such as rock paths and gardens in public areas of their villages, e.g., near latrines. This seems to be catching on with some villages competing to see which one can most beautify its surroundings. The U.S. government, through the State Department’s Bureau of Population, Refugees, and Migration (PRM), is proud to partner with Rwanda’s Ministry of Disaster Management and Refugee Affairs, UNHCR Rwanda, the World Food Program (WFP), and ARC to support protection and assistance for refugees in Rwanda. Aside from its contributions through UNHCR, PRM has been providing significant direct funding (in FY11 the grant was $ 1.7 million) to ARC to facilitate the provision of water, hygiene, and construction services in Gihembe, Nyabiheke, and Kiziba refugee camps, as well as gender-based violence prevention and response, and health and nutrition services in Gihembe and Nyabiheke camps. The United States, through USAID’s Food for Peace Program, is also a major contributor of food aid to WFP to ensure the adequate supply of food rations to refugees in Rwanda, and PRM made a cash contribution in 2011 to help rectify food pipeline breaks. Through a PRM Julia Taft Fund project via U.S. Embassy Kigali, funding was also provided to ARC to implement a poultry raising income generation project for widows and other vulnerable refugees in Gihembe Camp. PRM looks forward to continued partnerships in 2012 and significant financial support in all three camps. During several PRM monitoring visits to Rwanda’s refugee camps in 2011, certain pressing needs, such as improving the camp’s water pumping station and dealing with the rapidly deepening ravines caused by erosion of the hillside, were highlighted and we look forward to working with the Rwandan government, UNHCR, ARC, and other partners to address these needs in 2012. Finally, an exciting technology that we have been discussing with UNHCR and ARC involves the introduction of low cost “solar light” bulbs crafted from empty plastic soda bottles inserted into iron sheeted roofs. On any clear day, these solar light bulbs, which cost only a few dollars each to create, refract natural light and channel the equivalent of 55 watts of electrical light into a school, health center, or residential structure. ARC intends to initiate a pilot project to install these solar bulbs in the larger structures in Kiziba refugee camp that we hope will provide low-cost illumination for school children, doctors, and patients. Our continued support to these camps in Rwanda helps improve the lives of refugees until a durable solution to their displacement can be found. David M. Robinson serves as Acting Assistant Secretary of State for Population, Refugees, and Migration. With an estimated 40 million displaced people worldwide, up to 12 million who do not have citizenship to any country, and some 10.5 million refugees around the globe, the State Department’s Bureau of Population, Refugees, and Migration (PRM) assists persecuted and uprooted people through our support to international organizations and non-governmental organizations (NGOs), and by advocating for their protection through humanitarian diplomacy. From the Arab Awakening to the crisis in the Horn of Africa, global political upheaval and conflict have presented many humanitarian challenges, and as 2012 begins, I’d like to take a moment to share a few examples of the work we did last year. Refugee Admissions: The United States welcomed more than 56,000 refugees to re-start their lives thanks to the U.S. Refugee Admissions Program. English as a Second Language pilot programs provided basic language training to hundreds of U.S.-bound refugees in Kenya, Thailand, and Nepal. Our overseas partners reported a significant increase in basic skills and confidence. We anticipate increased enthusiasm for studying English after arrival in the United States — a key skill for newly arrived refugees when seeking employment to become self-sufficient in their new communities. Africa: In Africa, we supported international organization and NGO efforts to assist some 170,000 Ivoirian refugees in Liberia as well as hundreds of thousands of Ivoirians who were internally displaced as a result of conflict in that region. This spring, turmoil in Libya forced over one million persons to cross into Tunisia and Egypt. In response, PRM supported the emergency evacuation and repatriation of stranded third-country migrants, assistance and protection efforts for refugees and internally displaced persons, and emergency medical care and protection programs for conflict victims and detainees. Our partnership in this effort with the International Organization for Migration (IOM) and the United Nations High Commissioner for Refugees (UNHCR) was a model of multilateral humanitarian action at its best. 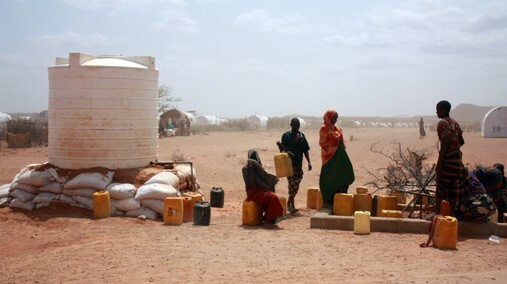 In the Horn of Africa, conflict and famine in southern Somalia forced another 300,000 Somalis to flee in 2011, bringing the overall Somali refugee population in the region to nearly one million. PRM funding to international organization partners and NGOs provided shelter, food, and other assistance to Somalis in need, and we sponsored a series of colloquia in the region to bring affected governments — especially those who have played an important role in hosting large numbers of Somali refugees — and service providers together to begin developing a unified strategic plan to address the crisis. Middle East: Supporting Iraqi refugees in the Middle East continued to be one of our top priorities. Inside Iraq, PRM assistance programs help support voluntary returns and reintegration, for example, though home reconstruction, rehabilitation of water and sanitation systems, employment services and protection assistance. In neighboring countries, our funding supports a range of services for Iraqi refugees, including education, health care, and food assistance. In Jordan, Syria, Lebanon, the West Bank, and Gaza, PRM’s continued contributions to the United Nations Relief and Works Agency for Palestine Refugees (UNRWA) supported vital programs in education, health, and social services to five million Palestinian refugees. UNRWA’s commitment to peace and tolerance is a force for stability in the region and is an indispensible counterweight to extremism. South and Central Asia: PRM supported UNHCR as it built its two hundred thousandth shelter for Afghan refugees returning to Afghanistan. We continued to advocate and provide assistance for the 2.7 million Afghan refugees outside Afghanistan as well as for Pakistanis displaced by conflict and flood. In Nepal, PRM supported UNHCR protection and assistance to Tibetan refugees transiting to India. We continued to support UNHCR assistance to 55,000 Bhutanese refugees, many of whom are in the process of resettlement to the United States. With PRM funding, UNHCR and the Turkmenistan government conducted a country-wide registration campaign, identifying approximately 8,000 stateless persons. More than 3,000 verified stateless people were granted Turkmen citizenship, with more expected in the coming months. Turkmenistan also acceded to the 1954 Convention relating to the Status of Stateless Persons. Western Hemisphere: PRM humanitarian diplomacy saw progress when the Panamanian government passed a law granting approximately 900 indigenous and Afro-Colombian refugees the ability to request residency and work permits. We promoted solutions to statelessness in the Dominican Republic. In Haiti, PRM focused on addressing the protection needs of earthquake-displaced Haitians and building government capacity to address gender-based violence and trafficking in persons, with an emphasis on assistance for vulnerable women and children. Europe: Our diplomatic efforts and assistance programs in the Balkans worked towards a lasting solution for those displaced since the mid 1990s war. In November, Bosnia and Herzegovina, Croatia, Montenegro, and Serbia signed a joint declaration aimed at providing durable housing solutions to the 74,000 most vulnerable refugees and internally displaced persons remaining in the four countries — a landmark achievement. Migration: PRM migration programs supported direct assistance to vulnerable migrants, government capacity building, and regional coordination and dialogues on migration issues. The United States played a leadership role in several regional and international governmental forums, chairing the Intergovernmental Consultations on Migration, Asylum and Refugees, the largest global forum for dialogue on migration and development issues. Population: Last year, the global population reached 7 billion, providing multiple opportunities to highlight U.S. leadership in investing in women and girls as essential to solving the world’s most challenging problems. Women and girls are the world’s engines of change. When their rights are protected and promoted, when they are healthy and educated, and when they can participate fully in society, they trigger progress in families, communities, and nations. Promoting sexual and reproductive health, reproductive rights, and access to safe and effective voluntary methods of family planning are at the top of President Obama’s global health agenda. PRM supported these goals by representing the U.S. government at meetings of the UN Population Funds’ (UNFPA) Executive Board and at the annual session of the UN Commission on Population and Development. Statelessness: Under the Secretary’s leadership, the Department launched an initiative to promote women’s equal right to nationality. At UNHCR’s ministerial event in December commemorating the 1951 Refugee Convention and the 1954 and 1961 Conventions on Statelessness, Secretary Clinton spoke about discrimination against women as a major cause of statelessness around the world. PRM also targeted statelessness of Haitians and Dominicans of Haitian descent in the Dominican Republic, addressing the issue in several public forums and supporting UNHCR and others as they seek solutions to this enduring problem. What’s in store for 2012? At the UNHCR ministerial, the United States renewed its commitment to displaced people by pledging to take concrete steps to address statelessness, women’s nationality issues, protection for lesbian, gay, bisexual and transgender (LGBT) refugees and asylum seekers, and to improve detention and asylum practices. Our continued support to our international organization and NGO partners and our diplomacy in 2012 will help improve the lives of millions of persecuted people who have suffered through upheaval and tragedy. Nancy Lindborg is USAID’s Assistant Administrator for the Bureau for Democracy, Conflict and Humanitarian Assistance. The drought gripping the Horn of Africa has focused all of us on the imperative of building resilience. We know we can’t prevent drought, but we can use improved and smarter programs to create greater resilience and improve food security. We can make progress that ensures the next time a drought hits the Horn, it won’t push 13.4 million people — unimaginably more than New York City and Los Angeles combined — into crisis. So what is resilience exactly, and what are the key methods for success? In pursuit of that answer, USAID convened last week, in partnership with IFPRI and our many partners, a two day workshop on “Enhancing Resilience in the Horn of Africa: An Evidence Workshop on Strategies for Success.” Through President Obama’s Feed the Future initiative, the U.S. government now has a powerful global hunger and food security initiative that connects its enduring commitment to humanitarian assistance with increased investments in agriculture and nutrition and sound policy. This workshop was designed to inform our programs with the our best lessons and strategies for tackling chronic food insecurity. “Resilience” is quite literally the ability to jump back; to return to original form. It has become a vivid one-word way to capture the importance of providing emergency assistance in a way that helps families and communities both withstand shocks and, as importantly, become more stable and food secure. While there is not a common accepted definition of resilience, building resilience generally involves reducing the likelihood and severity of crises; building capacity to buffer or absorb shocks; creating and enhancing communities’ or families’ ability to respond; and reducing the impact of crises. The workshop underscored how much we have already learned from previous drought and famines. In Ethiopia in 2002-2003, drought left 14 million people in need of emergency aid – more than those currently in need throughout the entire Horn region today. Out of that tragedy grew policies, programs, and approaches that have made a lasting impact. In fact, some 7.5 million fewer people in Ethiopia are not part of the emergency caseload because of the work collectively done since the last drought. At USAID, we are committed to connecting more effectively our humanitarian and development efforts through joint planning cells that develop coherent programs to do more than meet immediate needs. Working with our UN and NGO partners, USAID has included in our emergency assistance a focus on building community infrastructure to harvest rainwater and improve irrigation, improving livelihoods for women, and repairing degraded landscapes for better grazing and agricultural production. We worked with the World Bank, other donors and the Ethiopian Government to use our food assistance to build productive safety nets that help families move from crisis toward greater food security. We are introducing improved and more nutritious food products in partnerships with USDA and the private sector. And we have become one of the global leaders in use of local and regional procurement of food aid in a way that stimulates local production. Programs such as the Productive Safety Net Program in Ethiopia and a program in Kenya connecting livestock farmers to markets have helped families and communities cope with shock and increase their incomes. The drought and famine in the Horn remains the world’s worst humanitarian crisis and continues to command our attention and involvement, but it also has given the global community an opportunity to change the way we do things. The workshop reinforced that we have a critical moment of alignment: heads of state, regional institutions, UN agencies, non-governmental organizations and the private sector have all converged in their understanding that resilience is critical as we seek to reduce humanitarian suffering and increase the ability of families to survive the inevitable shocks of drought, floods and other natural disasters. We have the tools to address the challenges ahead, but it is clear that none of us can succeed alone. The workshop closed with a shared vision of change that we believe will bring a more hopeful future. Omar Cardentey serves as Public Affairs Officer at U.S. Embassy Djibouti. 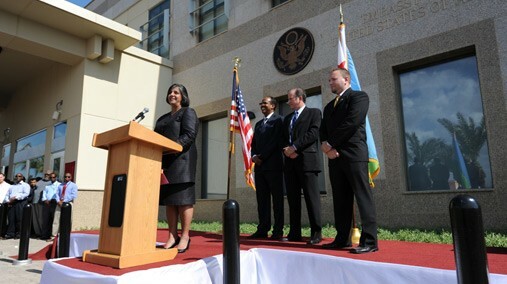 On December 7, 2011, ministers of government, members of the diplomatic corps, and over 300 guests gathered outside, in the dead of winter, to inaugurate the new U.S. Embassy compound in Djibouti. At 10 a.m, the mercury read ninety degrees. Located in the tumultuous Horn of Africa, the U.S. Mission in Djibouti plays a vital role in promoting stability in the region. It also makes its home in one of the hottest places on Earth. U.S. Ambassador to Djibouti Geeta Pasi and her staff welcomed guests to the new compound, a state-of-the-art facility built by the Bureau of Overseas Building Operations. At the opening, OBO was represented by Managing Director Jay Hicks. Djiboutian Foreign Minister Mahmoud Ali Youssouf also attended the event. New “green” initiatives implemented in similar compounds around the world are even more essential here, in a country that has less than 0.4 percent arable land and chronic food security concerns. The mission works in tandem with other U.S. government partners and the Djiboutian government to provide food and support to drought victims. American and local employees teamed together to lead tours through the compound, which included stops at the multipurpose room, cabana, and art collection. Tours even gave guests an opportunity to sample freshly filtered water at the Reverse Osmosis Water Purification Units on the compound. U.S. Embassy Djibouti staff worked day and night to pull off the grand opening. The hopes were that guests left not only entertained, but also with a better understanding of day to day life in a modern American Embassy. The nation of Gabon in Sub-Saharan Africa straddles the equator and is one of the least densely populated countries in Africa. The nation, which is about the size of Colorado, has an estimated population of 1.54 million people, which is smaller than some U.S. cities. The week after Thanksgiving I had a chance to visit Gabon while supporting a senior leader visit by Ambassador J. Anthony Holmes, U.S. Africa Command’s deputy to the commander for civil-military activities. The visit’s main focus was maritime security in the Gulf of Guinea and regional cooperation, but we got an opportunity to visit the Gabonese military’s HIV/AIDS program at Camp Baraka in Libreville. The HIV prevalence rate in Gabon is estimated at 5.9 percent, with approximately 49,000 people living with HIV/AIDS. In the Gabonese Armed Forces, roughly 5,000 members, the HIV/AIDS prevalence is estimated at 4.3 percent. We were told by staff at the U.S. Embassy that HIV/AIDS prevalence in Gabon is notably higher among young people and military personnel, which makes programs like Gabon’s Anti-AIDS Military Program (PMLS), established in 2002, very important. PMLS provides training, medical care and support, and outreach and educational activities targeted at vulnerable kids, orphans, widows and the military. The U.S. Government has been supporting Gabon’s Anti-AIDS Military Program since 2003 through the DoD HIV/AIDS Prevention Program (DHAPP). Support has included funding for the acquisition of laboratory equipment, reagents and supplies related to the diagnosis and treatment of HIV/AIDS. In fiscal year 2011, DHAPP provided $300,000 in funding support to Gabon. Our visit to Camp Baraka included a ceremony where Ambassador Eric Benjaminson, the U.S. Ambassador to Gabon, joined by Ambassador Holmes, presented a $5,600 donation in equipment for the center. The donation included a refrigerator for medical supplies, printers and a computer. The program also included a tour of the center and two special presentations. Members of the Gabonese military sang an original song that incorporates anti-HIV/AIDS messages that highlight the importance of knowing your HIV/AIDS status, getting tested, practicing abstinence, being faithful and using condoms. The song was followed by the Camp’s HIV/AIDS drama troupe performing a skit that put HIV/AIDS on trial. The effects of HIV/AIDS extend beyond health, family and social impacts. The epidemic also threatens a nation’s security by reducing military readiness, limiting deployments, and hindering a military’s ability to support regional response and peacekeeping activities. Reducing the spread of HIV/AIDS is a priority for U.S. Africa Command (AFRICOM) because of the disease’s destabilizing effects on a nation and the readiness of its military.